The moment your drywall is exposed to water or moisture, it could start growing mold if there are spores present. In fact, in the right conditions, you could notice visible mold within 24-48 hours after water exposure. Black mold will also spread quickly. Mycotoxins from mold may impact the health of people in your home. It's important to catch it as early as possible to prevent it from spreading throughout your home and potentially causing health effects for your family members. Dry black mold spores may become airborne. They get into your body through your nose as you breathe. The spores are microscopic, so you can't see them or know when you're inhaling them. Exposure to mold can cause health effects. The spores will get into the air when they are disturbed, so it's important to handle mold damaged materials with care. Make sure that you use the proper methods and equipment to prevent mold from spreading to other areas of your home. Better yet, hire a professional to come help you remove the mold and prevent future mold growth. If you think that you may have mold in your home, you should schedule our team to come to your home and look for evidence of water damage and signs of black mold. SERVPRO of Northwest Fort Worth is a mold remediation contractor. A mold assessment company can test the mold to determine what type of mold you have. Whether it's black mold or another variety, if mold has damaged your home, you want it removed and remediated right away. The proper steps need to be taken to prevent mold spores from becoming airborne, spreading through your home, and causing expensive damage. Black mold not only invades and damages your home, but it can also affect the health of your family. Some varieties of mold may not be a concern to healthy individuals, while other strains of mold produce mycotoxins. There are some key signs of black mold that may help homeowners or renters identify the toxin. Here are the top three signs of black mold. Mold thrives on water and humidity. If water damage is found in a house, it is very possible that black mold will be found with it. Rooms such as bathrooms and kitchens are especially susceptible to mold growth because of the high humidity in the atmosphere. Mold tends to grow near leaking pipes and condensation because it requires the presence of water. 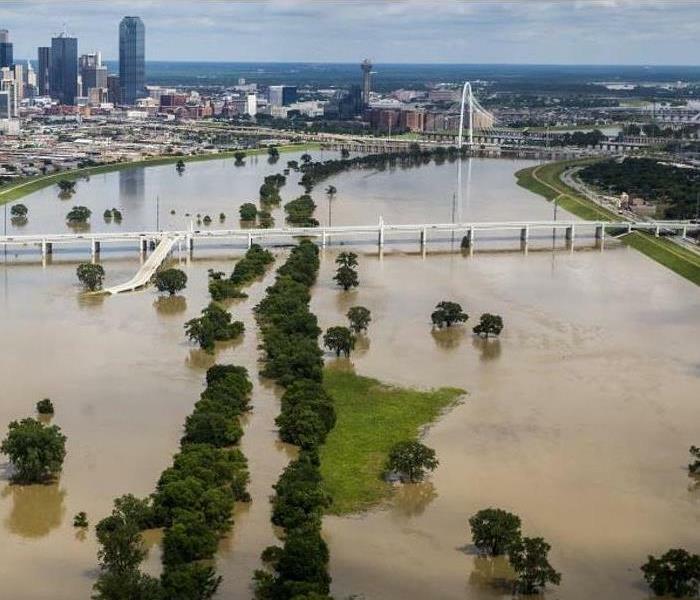 Call SERVPRO of Northwest Fort Worth out to your home to check for sources of moisture and to mitigate water damage as soon as you notice a problem. 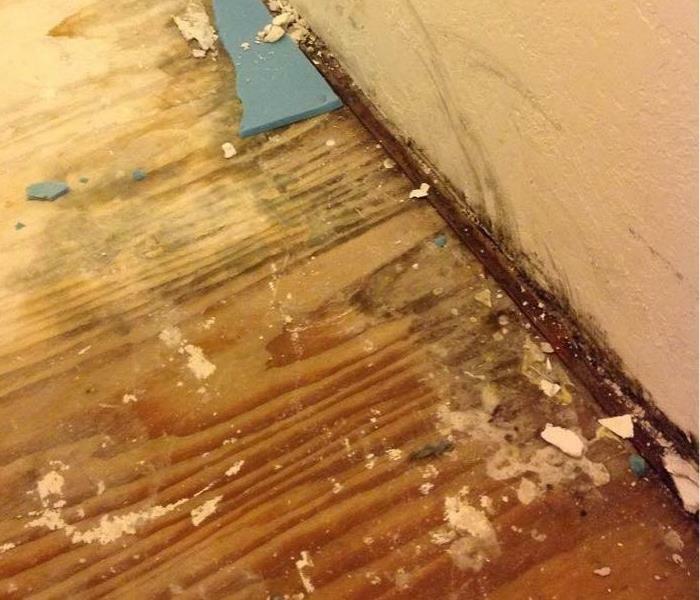 In North Texas, water damage that is left to dry out on it’s own often results in mold damage. Often times, mold has a smell. If there are certain rooms of your Haslet or Saginaw home that have odor that seems musty or a little off (some people describe it as a mildew smell), it could be mold. Black mold can grow just about anywhere if the conditions are right, so even if it’s a room where mold growth seems unlikely, it is still a good idea to get it checked. This common sign seems obvious, but if you think you are seeing mold damage in your home, then you are probably correct. Mold may be black or dark in color; sometimes it is fuzzy; and sometimes there are white threads or clusters of small dark specks. Make sure to check bathrooms, kitchens, and other humid rooms regularly for mold. Finding and treating mold is preferable to developing symptoms from it and wondering what the problem is. Look for a mold assessment company to help identify mold damage in your home. Then to remove the mold, you will contact a mold remediation contractor. There are many mold assessment companies and mold remediation contractors in and around Fort Worth. SERVPRO of Northwest Fort Worth is a mold remediation contractor. The best way to control mold growth is to control moisture. Set your thermostat to keep the indoor relative humidity low, or use a residential dehumidifier in damp areas of your home. Black mold can be a very dangerous substance. It’s important to be aware of the signs of mold to prevent, identify, and treat it. Black mold is often visible and can be smelled, so you suspect mold damage in your home call SERVPRO of Northwest Fort Worth at 817-232-3333 to set up an appointment. This Dollar General sign was in a disarray after being damaged by strong winds early Wednesday morning in Rhome, TX. The manager of the store arrived shortly after severe storms rolled through the area Wednesday to secure the back door. As you can see in the picture the sign was hanging while the rest of the sign blew into a tree across the street. Trim trees and shrubbery away from buildings and remove any weakened sections of trees that might easily break off and fall onto buildings. Contact your local utility company to trim away any limbs close to utility lines that could potentially pull down lines or even entire poles. When trimming trees it is important never to touch any wires. Trimming should usually be done by a contractor or the local utility company. Promptly remove any debris in your yard or surrounding your business, such as tree trimmings, to reduce the risks of flying debris during high winds. Avoid placing yard debris in an area where it could end up in the street or near drains, which could become clogged during a thunderstorm’s heavy downpour. Secure any parts of fencing that appear weakened or loose. High winds can easily dislodge boards and pieces from a fence, creating flying debris. When thunderstorms are forecast, remove loose objects outside, such as lawn furniture, signs, garbage cans and potted plants. HEPA 500 Air Scrubber and LGR Dehumidifier placed inside containment in kitchen area in Fort Worth TX. After discovering microbial growth in your home or business, call SERVPRO of Northwest Fort Worth at 817-232-3333. Believe it or not, mold problems can be mitigated with the right expertise and equipment. SERVPRO of Northwest Fort Worth has trained technicians that are able to identify and remove the mold damaged materials, and then restore the space to preloss conditions. 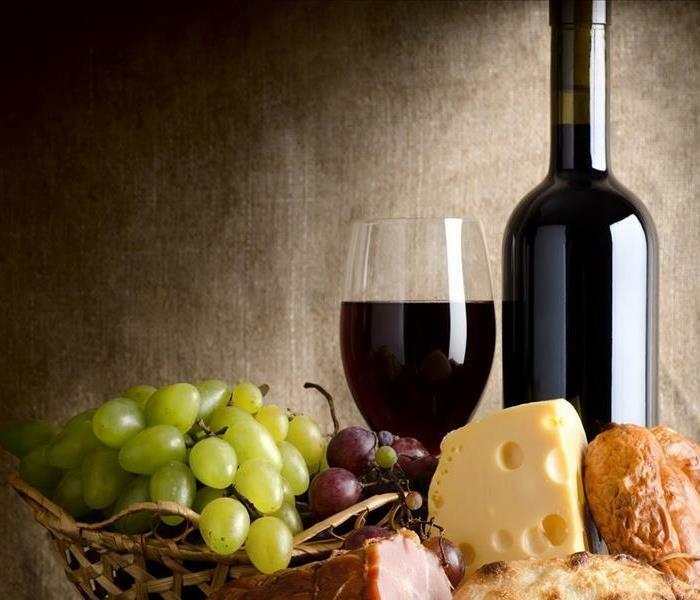 Proprietary Antimicrobial Treatments - applications of special biocide product that is safe to use in homes, hospitals, kitchens, and around humans and pets. HEPA 500 Air Scrubbers - remove mold spores and other particulate from the indoor air with efficient 2-stage filtration. Dehumidifiers - either Low Grain Refrigerant Dehumidifiers or Desiccant Dehumidifiers will be placed to remove excess moisture from the air and the building materials. Hydroxyl Generators - odor neutralization using a state-of-the-art system that converts organic and inorganic gases and air pollutants into carbon dioxide and water. Custom-Built Containments - isolate the problem areas from the rest of your home or business with sturdy plastic containment. If You See Signs of Mold, Call Us Today – 817-232-3333. 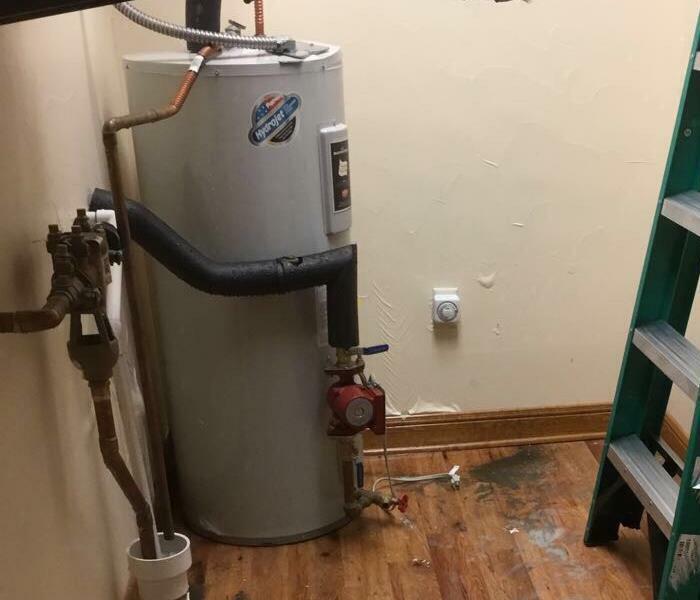 A broken hot water heater created several inches of standing water in this Fort Worth, TX business. Our highly trained technicians extracted the water, removed the cove base, and drilled holes for drying inside the walls and under the cabinets. Drying equipment was set up to help speed up the process. 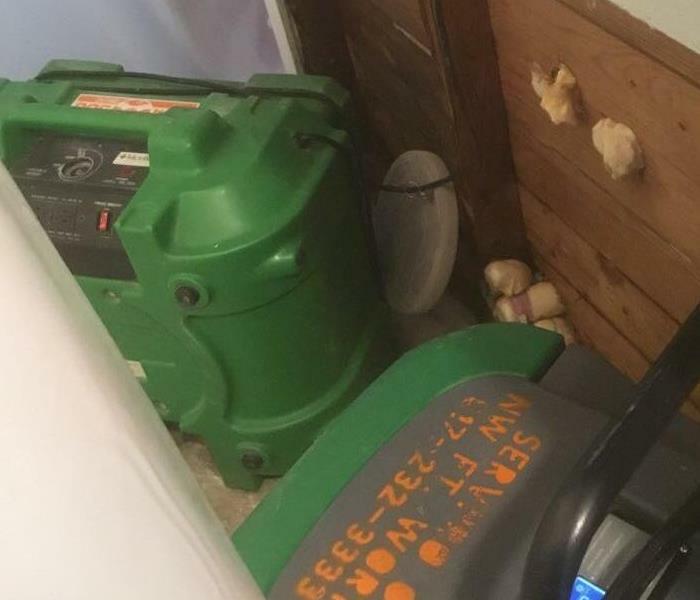 SERVPRO of Northwest Fort Worth worked around the clock to restore the effected area and prevent any secondary damage from occurring. We know that commercial water damage can cost a business thousands of dollars in productivity; it is always our goal to help keep your business running as flawlessly as possible through the restoration process. Flooding and water damage is very invasive. Water quickly spreads throughout your business and gets absorbed into floors, walls, furniture, and more. SERVPRO of Northwest Fort Worth arrives quickly and starts the water extraction process almost immediately. This immediate response helps to minimize the damage and the cleaning and restoration costs. 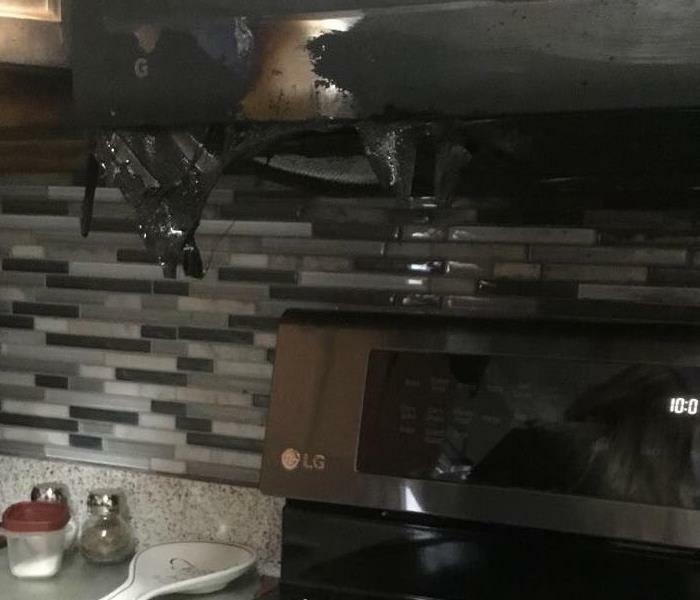 A cooking fire in this kitchen shows the black soot left behind in Saginaw, TX. As you can see in this before picture the microwave melted and left behind a mess to clean up. SERVPRO of Northwest Fort Worth was called immediately! Our highly trained technicians assessed the damage to begin cleaning. Smoke and soot affected the kitchen as well as the air ducts, walls, ceiling, and floors. After testing the walls, ceiling, air ducts for smoke and soot, cleaning was completed as well as, removal of microwave and cabinets. Our equipment was set up to help deodorize and remove the offensive odor left behind. 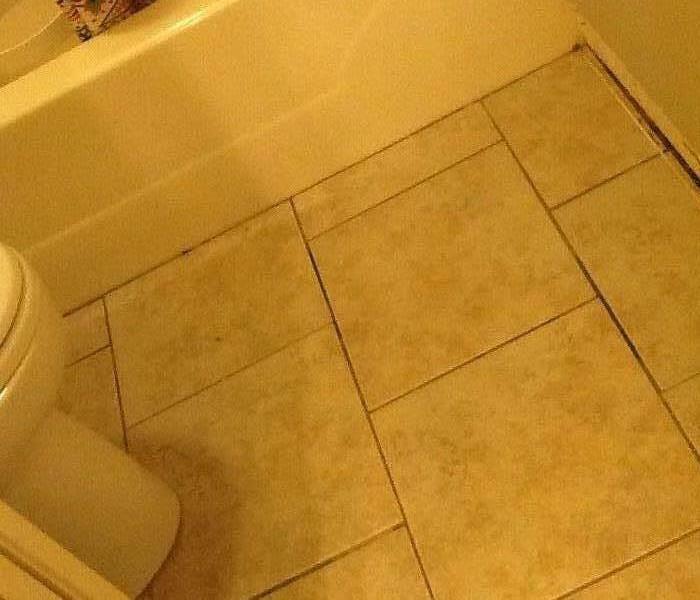 When the job was complete the customer was very satisfied! 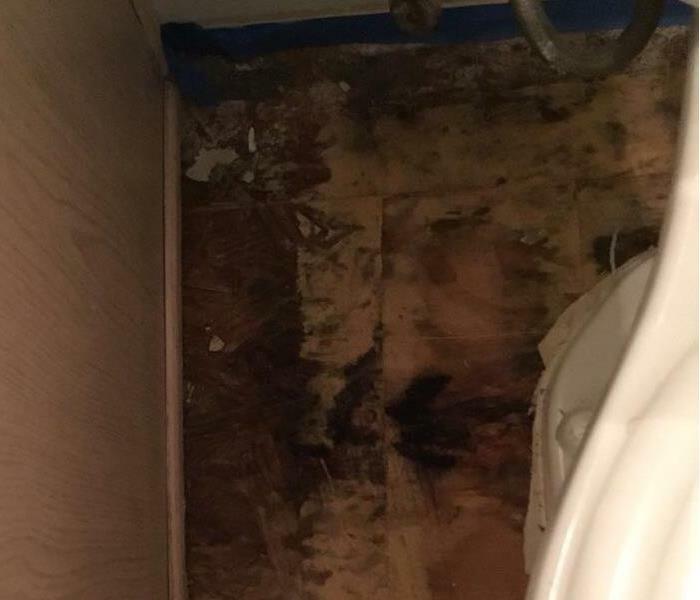 A toilet supply line breaks during the night in this home in Aurora, TX. Water damage affected the upstairs bathroom as well as several rooms downstairs. The call was made after hours and SERVPRO of Northwest Fort Worth professionals responded FAST! We sent our highly trained technicians out to assess the damage to begin the process of restoring affected areas. Baseboards had to be removed along with the carpet floated, drywall cut out, and subflooring had to be dried out for upstairs. Our powerful equipment sped up the drying process to help minimize further water damage. Overall, the homeowner was happy we were close by and responded so quickly! Flooding and water emergencies don’t wait for regular business hours and neither do we. [[Franchise Name]] provides emergency cleaning and restoration services 24 hours a day, 7 days a week—including all holidays. Flooding and water damage is very invasive. Water quickly spreads throughout your home and gets absorbed into floors, walls, furniture, and more. SERVPRO of Northwest Fort Worth arrives quickly and starts the water extraction process almost immediately. This immediate response helps to minimize the damage and the cleaning and restoration costs. SERVPRO of Northwest Fort Worth specializes in the cleanup and restoration of residential and commercial property after a fire, smoke or water damage event. Our staff is highly trained in property damage restoration. From initial and ongoing training at SERVPRO’s corporate training facility to regular IICRC-industry certification, rest assured our staff is equipped with the knowledge to restore your property. Heavy rain storms caused flooding into home in Ft. Worth, TX. The homeowner was out of town and was not aware of the storm damage until a week later. Our trained technicians arrived fast to assess the damage to find signs of visible mold on the walls. The contents in the garage were removed along with the saturated drywall in heavily affected areas. Next, equipment was set up to help speed up the drying process. The homeowner was pleased with the results and how we walked them through the job process. Flooding and water emergencies don’t wait for regular business hours and neither do we. SERVPRO of Northwest Fort Worth provides emergency cleaning and restoration services 24 hours a day, 7 days a week—including all holidays. Photographs, books, and other paper goods -start to swell and warp. 3/22/2019 - Don't Let It Grow!